Another two-door day special for Day 12 of our advent calendar! This is the kitchen at our family home in Farm Hill, Woodingdean. The white door opens onto the hall, which we saw earlier this week. The material hanging behind Dads’ head is another curtain. If you pull it aside you’re in our walk-in larder, which was always full of supplies. The food was kept in here, and the everyday plates, cups, saucers and cutlery. 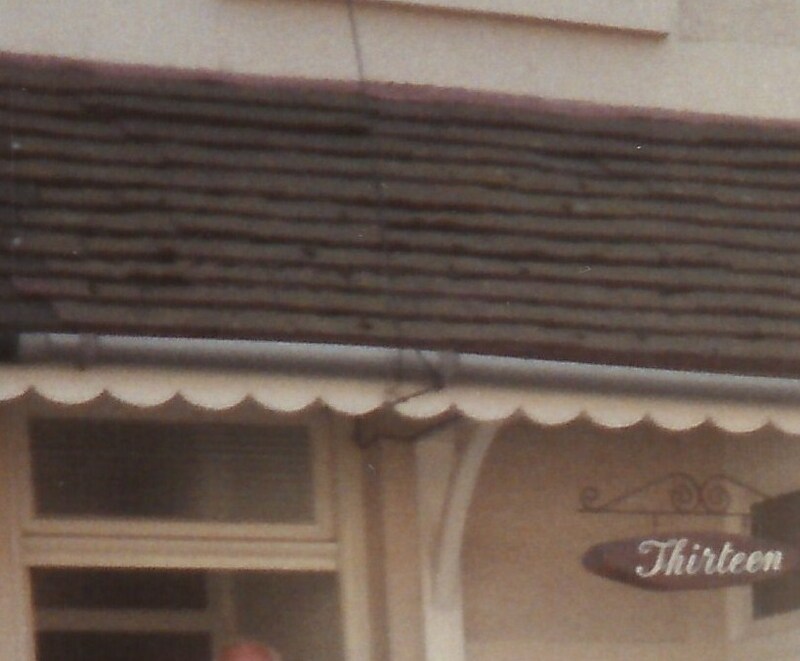 The best crockery and cutlery was stored in the sideboard in the dining room, and hardly ever used. The photo is dated the 23rd of December, and at this time every year Nancy and the family would come over to us, or we would go over to them and exchange our Christmas presents. I have another photo taken the same day. 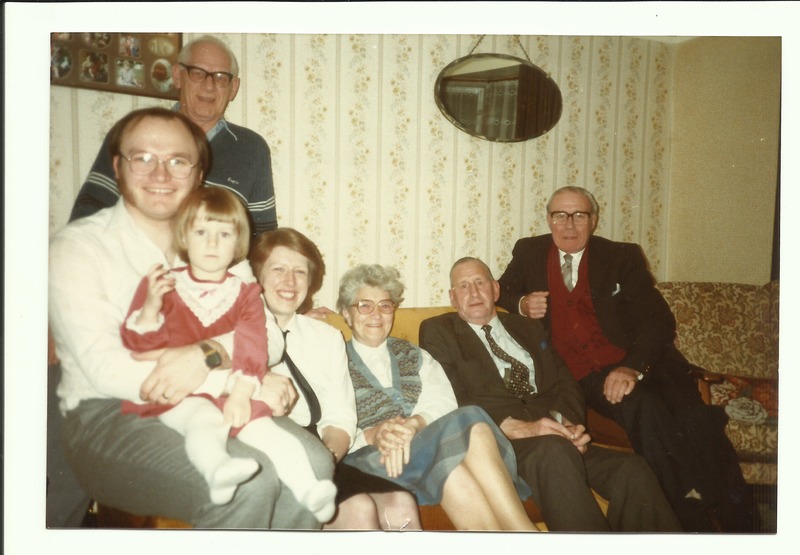 From right to left: Bert, Nancy’s husband; Jack, Gordon and Nancy’s brother; Enid, my mother, me, my daughter Emma and her dad Dave. At the back is my dad, Gordon. I always loved these family afternoons, it was so lovely catching up with everyone and having a laugh, cup of tea and giving out presents. 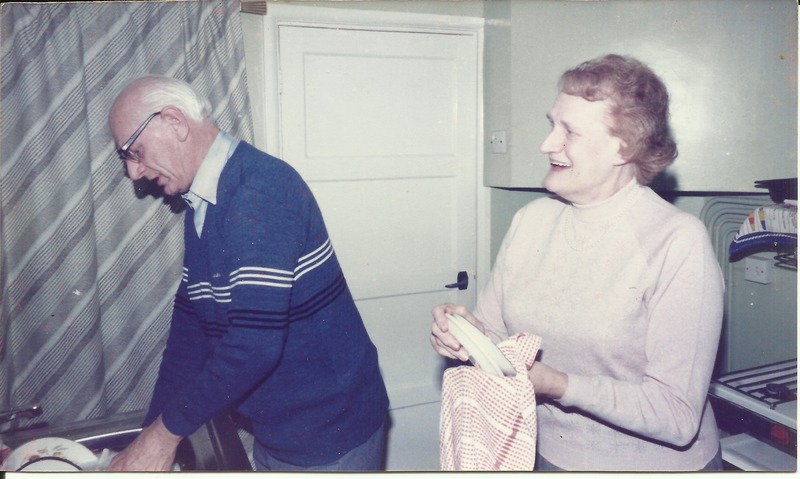 This entry was posted in DINNIS, Enid May Howells, Gordon Charles Dinnis, Jack Douglas Dinnis, jackiedinnis, Nancy Dora Dinnis and tagged Advent, advent calendar, Christmas, cup of tea, Farm Hill, Joseph Herbert Arkell, washing the dishes, Woodingdean. Bookmark the permalink.